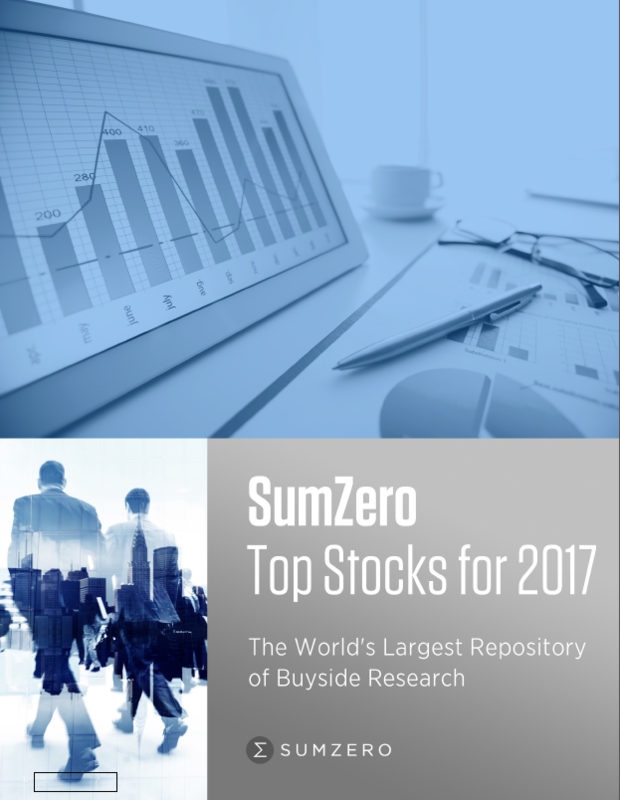 The SumZero Top Stocks for 2017 report is here. This research document contains 15 highly-rated ideas from SumZero individually selected to appear in this report through a meritocratic process, as well as a timely introduction courtesy of award-winning journalist and investor Morgan Housel (Collaborative Fund). The Top Stocks report is designed to honor the 5 Winners and 10 Runners-Up of the SumZero Top Stocks for 2017 Challenge, an investment research competition executed in partnership with Sohn Conference Foundation and Canalyst. With nearly 150 ideas submitted, the Challenge surfaced a large number of exceptional submissions. The 15 ideas featured in this report were the consensus favorites across 5 key categories. All contest submissions were independently assessed and voted on by a panel of 25 senior fund professionals and asset allocators. We would like to thank all the contestants for their all-around excellent work, as well as the members of the Judges Panel for their participation in screening their research, and our partners for their support of the initiative. Our sincere congrats go out to those professionals featured below. Access to the research submissions of all 15 Winners/Runners-Up is freely available in the SumZero Top Stocks for 2017 PDF via the link below and on the sidebar. Our sincere congratulations, once again, to the Winners/Runners-Up. Please sign in or create an account on SumZero to post a comment. For analysts/PMs at buyside funds (HFs, MFs and PE funds). Provides access to research, career placement, cap intro services, and more. For ongoing access to the research database, members can post research or purchase a read-only license. For institutional allocators (Family Offices, MFOs, FoFs, Endowments, etc. ), membership is free. Firms doing manager selection and allocating capital to asset managers should apply here. Free access to a select list of SumZero's top investment funds for vetting purposes, plus research access, jobs, and more. For sellside professionals, individual investors, FAs, wealth managers and other non-buyside investors. Access free research, data, and white-papers from the buyside community by signing up for our free weekly newsletter. Want access to more professional investment research? Join SumZero.